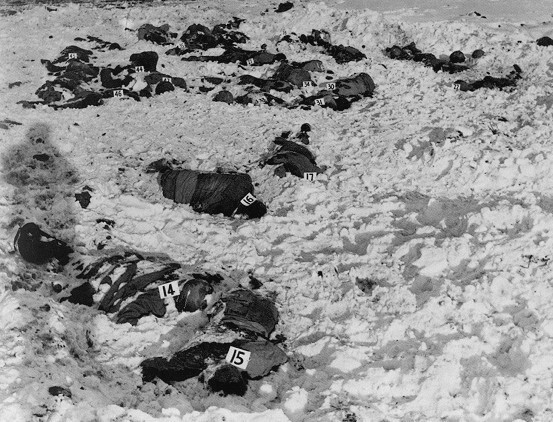 The bodies of 81 American soldiers from Battery B of the 285th Field Artillery Observation Battalion, killed by Waffen-SS troops on December 17, 1944, during the Battle of the Bulge near the Belgian town of Malmedy. In the last German offensive of World War II, three German Armies conducted a surprise attack along a 50 mile front in the Ardennes beginning on Dec. 16, 1944, and quickly overtook thin U.S. lines. Upon sighting the trucks, the Panzer tanks opened fire and destroyed the lead vehicles. This brought the convoy to a halt while the deadly accurate tank fire continued. The outgunned Americans abandoned their vehicles and surrendered. The captured U.S. soldiers were herded into a nearby field. An SS tank commander then ordered an SS private to shoot into the prisoners, setting off a wild killing spree as the SS opened fire with machine guns and pistols on the unarmed, terrified POWs. Survivors were killed by a pistol shot to the head, in some cases by English speaking SS who walked among the victims asking if anyone was injured or needed help. Those who responded were shot. A total of 81 Americans were killed in the single worst atrocity against U.S. troops during World War II in Europe. After the SS troops moved on, three survivors encountered a U.S. Army Colonel stationed at Malmedy and reported the massacre. News quickly spread among U.S. troops that "Germans are shooting POWs." As a result, the troops became determined to hold the lines against the German advance until reinforcements could arrive. Gen. Eisenhower was informed of the massacre. War correspondents in the area also spread the news. By January of 1945, the combined efforts of the Allied armies drove the Germans back to their original starting positions in the Battle of the Bulge. U.S. troops then reached the sight of the massacre, now buried under two feet of winter snow. Mine detectors were used to locate the 81 bodies, which had rested undisturbed since the day of the shootings and by now had frozen into grotesque positions. Forty one of the bodies were found to have been shot in the head. As each body was uncovered it was numbered, as seen in the photo above. While the U.S. medical teams performed this grim task, columns of German POWs being led by Americans passed by, with the bodies in plain view, however, no act of vengeance was taken. Following the defeat of Nazi Germany, 74 former SS men, including Jochen Peiper and SS Gen. Sepp Dietrich, were tried by a U.S. Military Tribunal for War Crimes concerning the massacre. The two month trial began May 16, 1946, in a courthouse at Dachau. But controversy soon arose. The defense team raised allegations of mistreatment including physical abuse by the U.S. Army and cited the use of mock trials in obtaining SS confessions as improper. The defense also complained that the court's legal expert, a Jew, constantly ruled in favor of the prosecution. The trial included testimony by a survivor of the massacre who was able to point out the SS man that actually fired the first shot. On July 11, 1946, the Judges returned a verdict after two and a half hours of deliberation. All of the SS were found guilty as charged. Forty three, including Peiper, were sentenced to death, and 22, including Dietrich, were sentenced to life imprisonment. The others got long prison terms. They were taken to Landsberg Prison, the same prison where Hitler had served time following the failed Beer Hall Putsch of 1923. Controversy continued, however, as various U.S. Army Boards conducted critical reviews of the trial process and methods used during pretrial interrogations. As a result, most of the death sentences were commuted and over half of the life sentences were reduced. Political complications arose after the Soviets blockaded Berlin in May of 1948. The strategic importance of post-war Germany in the emerging Cold War became apparent to the U.S. amid public outcry in Germany against war crime trials being conducted by the U.S. Army. In 1949, following a series of public charges and counter charges by trial participants and further investigations over whether justice had been served in the conduct of the trial, six of the remaining death sentences were commuted. A U.S. Senate Armed Services Subcommittee then began an investigation, led by Sen. Joseph McCarthy, concerning the U.S. Army's overall handling of the case. The Senate investigation heightened the controversy surrounding the trial, due in part to the aggressive behavior of Sen. McCarthy. By the early 1950s, following years of accusations, denials, investigations, controversy, and political turmoil, the final remaining death sentences were commuted and release of all of the convicted SS men began. In December of 1956, the last prisoner, Peiper, was released from Landsberg. He eventually settled in eastern France. On July 14, 1976, Bastille Day in France, Peiper was killed when a fire of mysterious origin destroyed his home. Firefighters responding to the blaze found their water hoses had been cut.